First up I think it’s best to have a quick look at what Reason 8 brings in way of new features, then we’ll compare that with what came in the Reason 7 update. Finally I’ll show my own little wishlist for features that I think are crucial. The biggest new feature is the drag and drop functionality. Definitely a nice feature which does add some speed to the general workflow, and the new browser approach is also much welcomed – although I would love to see ‘find-as-you-type’ functionality for the browser search. I’m sure these amps alone would justify the upgrade price for some users, but sadly I have rarely found guitar/bass amps to really suit my needs. I’ve played around with them and may try to use them, but I have a feeling they won’t crop up that often in my usage. I’m always happy to see design tweaks, if for nothing else to give my eyes something fresh to look at! Some nice subtle adjustments and changes, but I didn’t feel it was fundamental enough to be more than a footnote in the feature notes. Double-click to add/remove notes, drag note length from the start of a note as well as the end. These sort of features feel as they should be the footnotes rather than in a major feature list. This is very nice to have as it does speed up project management for me. For me, I don’t believe the new features really justified the price tag. However, it’s important to note that for someone that will benefit from the new amps, then it can be viewed as getting 2 amps at €55 each plus all the other tweaks for only €19 – bargain! I was part of the Reason 8 beta programme, and after using it for a while I had made the decision that I was going to pass and await Reason 8.5 or Reason 9. It would have been my first upgrade skip since I purchased Reason 3. However, then I discovered that all the tracks I’d been working on in Reason 8 wouldn’t open in Reason 7, and laziness got the better of me. I impulsively decided to upgrade rather than trying to back track… I probably could have worked around it but didn’t want to waste my time as it was the weekend and I was starting to mix the upcoming Ebauche album! Perhaps Propellerheads have spoiled us, but I did feel that this update was somewhat lacking in comparison to some of the previous upgrades. Personally I look at that list and see some much more profound features for using Reason as fully-fledged DAW, and all of these features first gave me the sense that I could abandon my old mixdown approach which was: bounce out Reason tracks, open in Cubase, mixdown. For the first time I am now doing the full mixdown in Reason, which is quite exciting for me. In addition midi-out, mp3 import support, spectrum EQ and the quite tasty Audiomatic plugin made this upgrade feel well worth it. 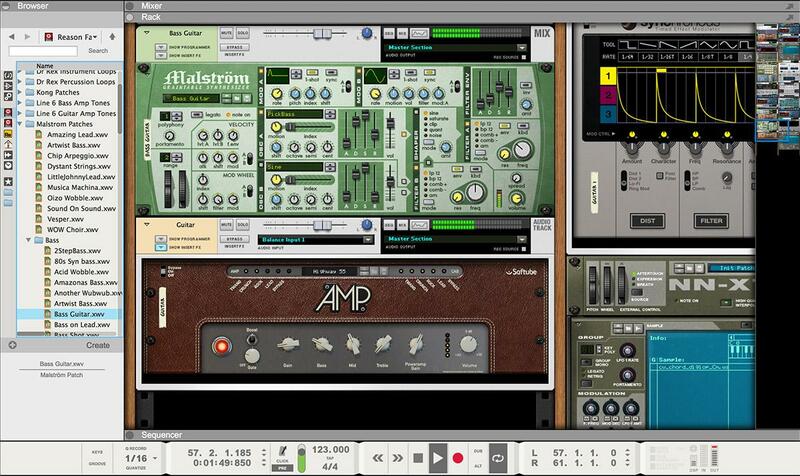 Another upgrade that felt good and juicy – primarily due to the excellent new plugins (which were the precursor to Rack Extensions in 6.5), but the merging of Reason and Record were a nice plus as well. Record and Reason merged – everything in its right place! My guess is that implementing drag and drop functionality and the overall codebase changes required to make it happen were probably quite a big undertaking for Propellerheads. I’m a web developer and I know all too well that there are no small changes. I continue to hold the Propellerheads developers in the highest regard. I just thought it would be beneficial to share my feelings as a producer, and also have the opportunity to cheekily push out my wishlist for the next upgrade.. I actually had a few more items in my wishlist but have recently discovered (by actually RTFM), that they’re already available!